A steel producer in Western Pennsylvania had slippery and worn step surface areas inside its plant. The manufacturer needed a viable solution to protect employees from slip, trips and falls. One of the troublesome spaces had open grated metal steps and landings. The aging steps were more than 20 years old and became especially slick because of oil and grease. The steel facility looked to improve employee safety in this high-traffic area. According to the National Safety Council, an injury occurs on the job every 7 seconds. Slips, trips and falls attribute to 25 percent of injuries that resulted in lost work days. While oil buildup during production may be unavoidable, there are options to create safe flooring. On a routine sales call, a Sure-Foot distributor walked through the steel plant with the maintenance staff. The plant team told him to be careful because an employee recently slipped in the slick space. A worker remarked slips and trips were common there because of the oil. Our Sure-Foot distributor was on site to discuss a different commodity, but immediately informed the staff of Sure-Foot’s anti-slip flooring solutions. The safety director was eager to hear more about Sure-Foot and ways to rectify the plant’s unsafe flooring situation. Our distributor spoke with the Sure-Foot sales team to review the best option for the steel facility. He provided our team with photos of the unsafe flooring in the facility so that we could determine the perfect fit. We began by assessing traffic patterns, environment and area use. After our discovery process, we recommended our fiberglass (FRP) step covers and walkway panels. Fiberglass has an inherit flexibility that works well in manufacturing plants. Its ability to bend and flex without snapping or cracking creates a long-lasting and affordable product. 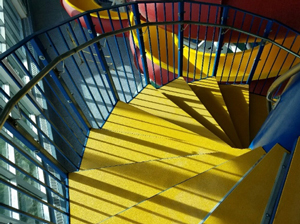 Our fiberglass material was a perfect match, along with being flexible on metal stairs, fiberglass step covers are also an environment resistant and durable product. Pound for pound, fiberglass is stronger than sheet metal. Plus, fiberglass is corrosion, chemical and fire-resistant, making it ideal for harsh work environments. FRP step covers are easily cleaned and maintained. “Our fiberglass product is growing exponentially because of all it has to offer. One of the highlights for clients is always its adaptability,” said Chris Kaskey, VP of Sales and Marketing, Sure-Foot. Sure-Foot sent fiberglass samples, product literature and installation procedures to the client for review. 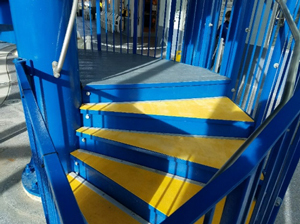 The steel plant’s safety director was impressed and approved the fiberglass solution for slippery stairs. He invited our distributor to return to address more bothersome areas, eventually measuring four more stair wells, including large walkway platforms and landings. The project grew from the initial 16 steps to approximately 90 step covers and multiple landings. The fiberglass solution provided large custom cut panels for the slick area. The panels were in yellow and black with Sure-Foot’s Medium and Heavy Duty grit surfaces. All materials were made to exact measurements, removing the need for any extra cutting or trimming by the client. Our grating clip kit fastened the fiberglass to the grated step and landings, making installation simple for the maintenance team. Since the first installation, the steel plant purchased more than 200 additional Sure-Foot step covers and landing panels. The steel facility reported a significant reduction of slips, trips and falls on the job site post FRP installation.